Hawthorn Regent tree on the Celtic calender goes from May 13 – June 9. This is a great time for magic concerning peace, prosperity, protection, fertility and marriage. 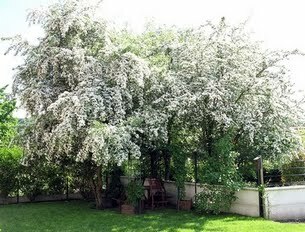 The Hawthorn tree can be seen in variations of trees and shrubs. The druids were said to use it‘s leaves and flowers to make medicinal teas. And the wood from the Hawthorn was known to provide the hottest fire. The Greeks and Romans saw the Hawthorn as a symbol of marriage. Although in Medieval Europe, the Hawthorn was associated with witchcraft, and was therefore seen as unlucky. In Ireland, Hawthorns covered in “clootie” prayer strips guard sacred wells. These are little strips of cloth blessed in the well, and then tied to the tree with a prayer. This magical little tree is also associated with the faeries. It is said that a Hawthorn growing on a hill near a sacred well is a marker for the faery realm. To celebrate the Hawthorn tree, pray to the Goddess Cardea, for the Hawthorn was her sacred tree. She is known as the Goddess who protects the home, put a piece of Hawthorn over any windows or doors in your home for protection from this Hawthorn Goddess. Emilio Cao, is a renown Galician musician who was the first to recover the harp as an instrument in the folk music of Galicia (there is evidence of its use in the Middle Ages) . Linked to several groups of his city, his early works were with groups Brétema or NHU. He also participated in the group “Voces Ceibes” (Free Voices) , he played songs in Galician language w/social, political context and against the Franco dictatorship. He was also member of the “Galician Popular Song Party”, a folk music songwriters group where he began composing his own songs. In the mid-seventies Emilio decided to see the world: exercise, among other trades, the musician in the subway in Paris, the dishwasher in restaurants in Barcelona, the gardener in Copenhagen, wandering around Amsterdam, etc. In 1976 he surrenders to “homesickness”, and passes through the window of a shop of musical instruments second hand and falls for a Folk harp. Like many other musicians, such is the love he professes to that instrument, that he absolutely self-taught himself, and works for hours to hone their management and composing his own songs. 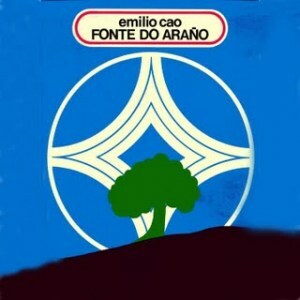 Edits his first album in 1977: “Fonte do Araño”,(Village Fountain) and began its relationship with other performers of that instrument, like Elsie Thomas of Swansea Welsh or Breton musician Alan Stivell. Alan himself would write the foreword album presentation. 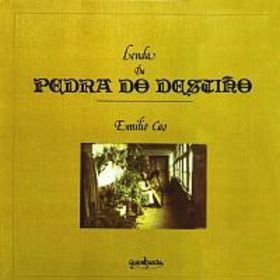 A landmark album involving Xosé Ferreirós and Xosé Antón Seoane (who would later form the reknowned Galician group “Milladoiro”) as well as Xoan Piñon and Bernardo Martinez (creators of the galician group “Doa”). This album, the first of the so-called Celti c music in Galicia, was a major shift for the music of his country and opened paths followed later by numerous artists. He has also collaborated with contemporaries such as Suso de Toro, Rei Anxo Ballesteros, Roberto Vidal Bolaño, Eduardo Alonso or Xulio Lago. As a musician he has collaborated with artists like Rupert Ordorika, Fausto, Siniestro Total and Maite Dono, which has covered some of his best known songs. Throughout his career he has maintained a long relationship with musicians and singers from Portugal (Fausto, José Afonso, Carlos Paredes, Mafalda Veiga …) projects and scenarios sharing the fruit of the great cultural proximity between Galiza and Portugal, also recently prepared projects with musicians from other Portuguese-speaking countries (East Timor, Angola …). Beginning in 1983, and alternating the recording of their albums, he composed numerous soundtracks for theater, visual and contemporary dance. In all these years he performed concerts in Spain and many European countries, with its intimate and evocative music from long ago, his country, Galicia, or sleep and dream worlds, who with his harp so we can carry easily. A Lenda da Pedra do Destiño. (Guimbarda, 1980). Amiga Alba e Delgada. (Boa-Do Fol, 1998, reprint). Cartas Mariñas. (Boa-Do Fol, 1998, reprint). Sinbad en Galicia. (Boa-Do Fol, 1998, reprint). (Official Press) Phamie Gow is currently based in London, is described by Australian Broadcasting Corporation (ABC The Planet) as a ‘young prodigy’ . Composer, Singer, pianist, lever harpist (acoustic and electric), accordionist, whistle player, and producer. In her late twenties, she has already five solo albums under her belt, Winged Spirit, Lammermuir, Dancing Hands Moments of Time, and, La Vida Buena – The Good Life. She has performed with the likes of Philip Glass, Band of Horses, Ashley MacIsaac, Carlos Nùñez, Alasdair Fraser, Eric Rigler (uillean pipes – Titanic, Braveheart), Allan Stivell, and many more. 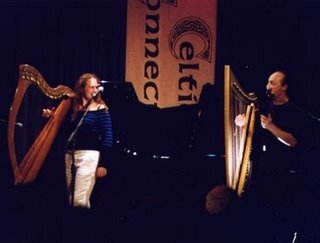 Winner of the ‘Danny award’ in Celtic Connections (1999) the ‘prix de composition de la ville de Dinan’ – composition award 2002 – France, and the Tap Water Award – ‘best music act in the Fringe 2002’ August 2002. Winner of the ‘Matt McGinn’ award 2003, ‘Best newcomer’. 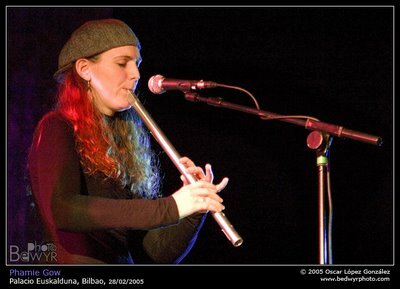 Phamie has performed in Broadway, New York on numerous occassions, including performances with International artists including the living legend Pete Seeger, and the sell out show `Tapeire`.. She was asked to play for his holiness the Dalai Lama, in a sell – out concert in Edinburgh`s Usher Hall to an audience of 2,500 people. ***** The Scotsman. Phamie`s most recent solo piano album, Moments of Time is featured on a regular basis on Classic FM (the UK`s national and most popular classical radio station) where they talked about her as being `a definate rising British star`. More recently, Phamie`s composition ¨War Song¨has been selected on The Smooth Classics – The Ultimate Collection alongside the great composers such as Bach, Vivaldi, Moricone, Zimmer, and more; released under the UNIVERSAL/Classic FM label. Awesome, original, rythmical, melodic, funky and exciting are words used to describe her performances on the harp. 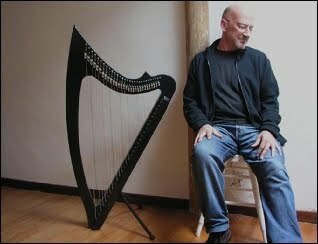 Forget about your preconceptions about the harp being for fairies! In her hands she is pushing forward the frontiers of this ancient instrument and is changing peoples perceptions about this instrument. Gone is the ball gown for this hip new inventive harpist. “In Gow’s capable hands, her electrified harp easily shifts between heavy metal and ethereal celestial music.” 14th October. 2007. The Globe and Mail. Canada. Enter this contemporary virtuoso who takes your breath away with her skill and charm, who is so at one with her instrument that audiences are transfixed, visually as well audibly. She looks quite spectacular as she engages with the instrument controlling a ‘harp with attitude’, her heels stamping out the beat consumed by the breakneck speed of some reel or flamenco. Sometimes she may play two melody lines at the same time as well as a bass line, and using the harp as a percussive instrument. Some people say that she plays the harp like a piano, and the piano like a harp! She is truly breaking new ground. Whether she is playing in a jam with Phil Cunningham or opening for giants such as a Kepa Junkera, or Seamus Heaney and Liam O’ Flynne, Main Auditorium, Royal Concert Hall, Glasgow, Phamie Gow is at her happiest performing. Hailed as ‘one of Scottish music’s most exciting young talents’ Sue Wilson, Sunday Herald, Phamie entertains with humour, interest and joy. What makes Phamie’s live appearances stand out is by her use of improvisation, and composing in the moment. She creates sounds out of the harp that you would never expect to be heard on the instrument. Beyond genre, musical boxing, she simply creates real music that touches peoples souls and as a listener, leaves you wanting more. 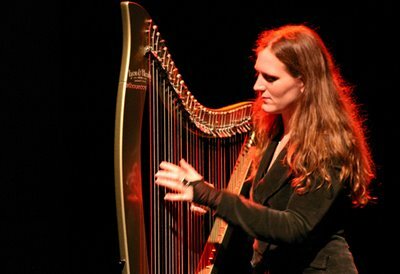 “Award-winning harpist Phamie Gow was astounding to listen to as she created sounds with the harp one would swear was three or four different instruments.” SooToday. Canada. This disarmingly charming young musician/composer has been commissioned for short films, dance and theatre companies, has given many workshops and masterclasses in festivals and conservatoires around Europe and Latin America. Her piano compositions have been used in university studies and concert halls, and Phamie is a part time tutor for piano at the Royal Academy of Music and Drama, Glasgow where she graduated in 2001, and also conducts masterclasses and workshops on how to compose. One of Phamie’s Gaelic song was sung by the Young Traditional Musician of the year 2004, James Graham, and was featured on his his debut album, Suibhal. Her setting Aonghas McNicol’s poem ‘ Bu tusa an gaol a bh’aire m’aire’ reached the finals of the Gaelic Eurovision song contest 2008. And …. a final string to her bow is the sound of her quartet, an energetic, dynamic and exciting set up of Phamie on electric harp, piano, accordion, whistle, voice and is accompanied by guitar, electric bass, and drums. This sound is best heard in festivals and out door events. Phamie’s musical evolution is so important to her, and one way of this being cultivated is by collaborating with other artsts of high calibre in different musical genres. Some collaborations she has created has been with the well known rock-pop group Band of Horses (North Carolina, USA), another has been with the Global celtic phenomenon Carlos Nùñez (Galicia in Spain), Kepa Junkera (Bilbao in Spain), Bajaly Suso (Gambian Griot and kora player), Scots singer/songwriterKarine Polwart who sang Phamie’s song, Goodbye to the sea and sailors, as featured on Phamie’s album, Dancing Hands. She has appeared on 13 different albums, and her first solo C.D ( 1999)’Winged Spirit’ (Wildfire Records) is a solo album which shows Phamie playing harp, piano, accordion, whistles, as well as singing. ‘She demonstrates admirable creativity and originality’ wrote Aibhlin McCrann and continuing. ‘Phamie Gow in this multi – faceted recording has shown that she is a creative force worthy of our attention’. Critics have described her second album ‘Lammermuir’ (2001) as ‘a masterpiece of Scottish music’ (Willi Rodrian – Radio Lora. Germany). Lammermuir is Catriona Black (Scotsman ‘full of sparky originality and sends a tingle up your spine’Gaelic Music Column). This album is a ‘live’ recording featuring Alasdair Fraser, Eric Rigler, James Ross, amongst others receiving ***** review from The Scotsman. Her third self produced album (2004), which was made possible with an award given from the Scottish Arts Council, Dancing Hands demonstrates a new sound, and is very up-lifting, fresh, and accessible. Phamie chose to work with 8 different fantastic musicians such as Ricky Steele (double bass), Tom Richardson (guitar), Fraser Fifiled (soprano sax, whistle), James Graham (Yound Tradtional Musician of the year 2004), Mattie Foulds (drums), Andy Webster (guitar), Karine Polwart (voice), and the Spanish percussionist, Javier Villar Morales. There is also a bonus track on the album which is a colloboration with DJ Daniel, and gives an example of another new possible project to arise. “Dancing Hands demonstrates Phamie’s full breadth and depth of musicianship. Whilst her previous albums have been enjoyable, this one is outstanding – exciting music, with a lot of variety, yet rounded with a clear thread running through it. An album of the highest calibre`..Michael Moll. Folkworld. In 2007 Phamie released her forth solo album and book, Moments of Time which her first piano solo album showing her skill as pianist and composer. ” played with great skill and expressive musicality, these dozen, often simple, pieces are laced with emotion, lyricism and an underlying sense of peace.” The Scotsman. 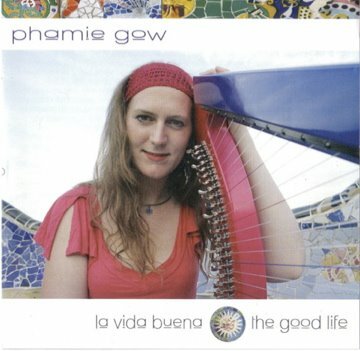 2008 had the release of ‘La Vida Buena – The Good Life’ which protrays again Phamie’s raw skill and talent as solo harpist, singer and composer. In the meantime, she is changing the preconcept ideas of the harp. Phamie Gow is clearly entertaining us with her never-ending creativity and talents.